Odds are you're not getting the eight hours of nightly shuteye experts agree you need. Here's why it matters - for you and your business. 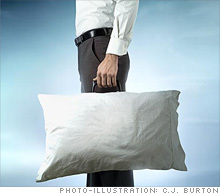 New research proves that fatigue, rampant in hard times, is bad for business. Here's how 8 entrepreneurs beat insomnia and get ROI from rest. Do you nap during the workday? Entrepreneur Jones-Hirvonen brainstorms while asleep. 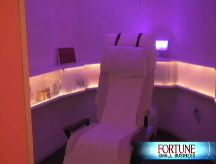 Never mind massages: At these spas, clients shell out for naps and insomnia relief. (Fortune Small Business) -- Are you getting enough sleep? For years, Cynthia McKay wasn't. McKay, CEO of Le Gourmet Gift Basket, a specialty-foods company based in Castle Rock, Colo., spent most of every night wide awake with her mind racing - "mostly due to the stress of business ownership and jet lag," she says. She managed to drag herself to the office each morning while her firm expanded into countries such as Canada and Australia. But in her permanently exhausted state, she found herself making more and bigger mistakes. The last straw, she recalls, came when she tossed and turned until almost dawn. After she finally dozed off, she slept right through the departure of her flight to Australia, where she was to have gone to train 17 new hires. McKay, 53, couldn't catch another flight until the next day. Meanwhile, her would-be trainees twiddled their thumbs, costing her thousands of dollars in food and lodging expenses. "It was an expensive mistake," she recalls. You may never have goofed so dramatically, but the odds are you're not getting the seven to eight hours of nightly shuteye experts agree you need. While some high-achieving entrepreneurs boast of requiring minimal z's, research shows that our sleep needs are surprisingly consistent. If you fail to get at least seven nightly hours, you're probably operating at a cognitive disadvantage. And your health and your business may be paying the price. Business owners seem to share a powerful ambivalence toward sleep, both craving and shunning it. That's especially true in this tough economy - a recent NFIB poll found that small-business owners are working longer, thanks to the slump - and during a firm's startup phase. Cornell University sleep researcher James Maas estimates that business owners lose at least 700 hours of sleep the year they launch their firm, or about what a parent loses the first year of a baby's life. So what? you ask. Aren't you more productive when you work 18-hour days? Can't you just prop up your drooping eyelids by downing yet another cup of java? Alas, no. New scientific research shows that going without enough sleep for more than an occasional day or two can wreak havoc on your health, memory, concentration, mood, and ability to make decisions - even if you think you're doing fine. "We've come to view getting enough sleep as optional," says Mark Rose-kind, a former Stanford University sleep researcher. "Unfortunately, our bodies disagree." If you need a good reason to start turning in earlier or sleeping later, the cavalry has arrived. It turns out that far from being a time waster, sleep makes you healthier, smarter, and a better leader - and may even yield great ideas for growing your firm. According to a 2007 survey by office-supply chain Staples (SPLS, Fortune 500), 51% of entrepreneurs say that they regularly dream about work. Of those, 70% report implementing their work-related dreams. The evidence that sleep matters is irrefutable and constantly growing. Let's start with a newly discovered link between sleep deprivation and serious illnesses such as diabetes and cancer. A 2008 research project at the University of Chicago's medical school kept young, healthy volunteers awake for all but four hours a night for six nights running. The result: The levels of subjects' hormones shifted - in particular a hormone called leptin that affects appetite. They became ravenously hungry, scarfing down pizza and ice cream long after they would have felt full normally, and their blood sugar shot up to pre-diabetic levels - an ominous result after less than one week of inadequate sleep. Other studies duplicate those results so regularly that researchers now believe that not getting enough sleep is a top cause of obesity and diabetes, both of which are on the rise nationally. At the same time, the World Health Organization (WHO) has gathered data from around the globe showing that sleep deprivation depresses the immune system, to the point where WHO is considering labeling chronic sleep deprivation a carcinogen, comparable to tobacco and asbestos. If you've ever been so weary that you had to reread the same paragraph many times to grasp its meaning and soon forgot what you read, you already know what sleep researchers have lately proved about the effects of too little sack time on productivity. "You can turn a smart person into an idiot just by over-tiring him," says Peter Capelli, head of the Center for Human Resources at the University of Pennsylvania's Wharton School in Philadelphia. One experiment at U. Penn's medical school kept subjects up until 4 A.M., woke them at 8 A.M., and then gave them a series of tests designed to measure memory, alertness, and the ability to react quickly to new information. The researchers were startled to find that subjects' mental acuity declined markedly after just one night and kept dropping with each successive night of four hours' sleep. Even more worrying: The study's volunteers were unaware of their impairment. One woman, so fatigued that she could barely say her name, was nonetheless certain she was able to drive home. Says David Dinges, who ran the project: "Like people who have had too much to drink, the chronically sleep-deprived have no sense of their limitations." The consequences can be dire - Dinges believes inadequate sleep was a factor in some of the world's worst accidents, such as Chernobyl and Three Mile Island. Imagine the implications for your small business. No matter how much you think you're accomplishing when you pull an all-nighter, it's likely far less than what you could achieve if you got some sleep and then returned to work, according to a recent study from the Sleep and Neuroimaging Lab at the University of California at Berkeley. When volunteers were given a list of words to memorize and then were kept awake for 24 hours, their ability to recall the words fell by 40%. Other new Berkeley studies show that the converse is true: Memory improves during sleep, so that if you get a full seven or eight hours' slumber tonight, your recall of all that happened today will be 20% to 30% sharper than it is immediately after the day's events occur. No one is sure yet why this is so.